Are you a huge fan of Find My Friends? Have you just been waiting to have this app available on your MacBook? Well, you’re in luck. If you’ve used the Find My Friends app on your iPhone or iPad, you know that it allows you to share your current location instantly with other folks who use iOS devices (as well as displaying their locations on a map on your device). 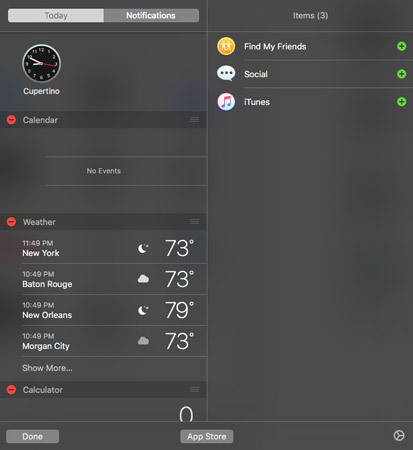 If you use Find My Friends, you’ll be happy to know that the functionality of this popular app is now available within El Capitan — specifically, it can be added to the Notification Center as a widget. It’s really quite easy. To add the Find My Friends widget, click on the Notification Center icon in the Finder menu bar, then click the Edit button at the bottom of the pane. (Check out the widget list that appears at the right.) Click the Add icon next to the Find My Friends item to add it to your Notification Center. Adding Find My Friends to your Notification Center is a snap.